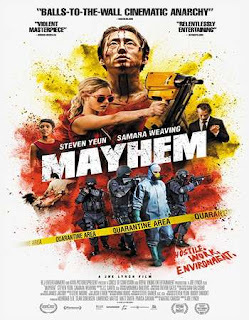 Mayhem 2017 English | FunToMovies 300 Movies '+g+"
Matias Caruso penned the script, which tells the story of a virus that infects a corporate law office on the day attorney Derek Saunders (Yeun) is framed by a co-worker and wrongfully fired. The infection is capable of making people act out their wildest impulses. Trapped in the quarantined building, our hero is forced to savagely fight tooth and nail for not only his job but his life. Info from variety..